So it turns out there wasn’t just one Zygarde in the set – there were three! A GX involving the fully-powered version, and then two lesser versions each involving the different forms of Zygarde. So to start, we take a look at Zygarde at 10%. Zygarde is a Fighting Basic Pokemon, 90 HP, with a Grass Weakness, no Resistance, and a Retreat Cost of 1. His Earthen Aura Ability lets him deal damage without worrying about Resistance…or Weakness…what? Why? What’s his attack? Peace Maker is a 1-for-30 move that does 30 more damage…but only if the opponent has an Ultra Beast in play. Against some of the more powerful Ultra Beasts, Zygarde would appear to be a…decent option. Except that there aren’t that many Fighting-Resistant Ultra Beasts, and the ones that are Weak to it don’t have to worry about taking more than 60 damage at a time. I dunno about you, but 60 damage isn’t really much of a threat to a lot of Pokemon. Unless you’re hitting something that’s not a EX/GX, but any deck that would likely be pushing a non-EX/GX into the Active slot without getting forced to probably isn’t running Ultra Beasts in the first place. If this was just ignoring Resistance, this Zygarde would be pretty good, but take away Weakness, and it’s not even going to be good enough to be a tech. Zygarde 71 (FLI 71) bounds into the meta out of the Forbidden Light expansion set. This 90 HP Pokemon has an ability and a lone single attachment attack. The ability, Earthen Aura, is the closest thing to being a disadvantage that I’ve ever seen on a Pokemon. Are you kidding? An ability that eliminates your weakness advantage against your opponent’s Fighting weak Pokemon? Are we sure this wasn’t mistranslated? And then its attack Peace Maker: only thirty base damage is understandable for a single energy attachment, but only thirty more if an Ultra Beast is in play? How about you make this card marginally playable and give it at least a 60 or 90 damage spif if an Ultra Beast is on your opponent’s side of the board. That might have made this Pokemon playable – as it is, forget it. It is CLEARLY inferior to its brother Zygarde 72… and you’ll see why in the twin bill of our double header today…. Thinking about it a little more, I will say that 60 base damage for a single attachment isn’t that awful – especially if you can boost it with a strong energy and a Choice Band and Diancie Prism. That 60 could easily increase to 130, which is pretty darn good for one energy. But it’s still not that great, only 90 HP means you’re getting KO’d pretty much every turn. We conclude the week not only by reviewing something other than a runner-up from the last countdown but two somethings. It is a twofer in the classic sense; reviewing two versions of the same Pokémon but without smooshing it all into a single review. Zygarde (SM – Forbidden Light 71/131), a Basic [F] Type Pokémon with 90 HP, [G] Weakness, no Resistance, Retreat Cost [C], the Ability “Earthen Aura” and the attack “Peace Maker”. 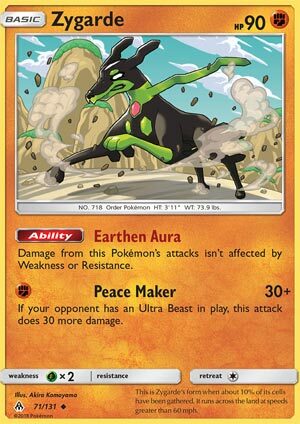 Earthen Aura states “this Pokémon’s” attacks don’t have their damage affected by Weakness or Resistance, while Peace Maker costs [F] and does 30 damage or – if your opponent has an Ultra Beast in play – 60. Being an [F] Type grants Zygarde access to useful support like Brooklet Hill, the Ability on Diancie [Prism Star], Strong Energy, etc. though there are a handful of effects that punish a Pokémon for being [F] Type (I’m don’t think any are currently competitive). [F] Weakness is one of the more common forms of Weakness, and [F] Resistance one of the less uncommon forms of Resistance; exploiting Weakness is far more beneficial than slamming into Resistance is detrimental and I’ll explain why that still matters later. 90 HP is enough not to be especially fragile, but Zygarde is still a probable OHKO. Zygarde’s own [G] Weakness isn’t the worst Weakness, but I’m hesitant to call it a “safe” Weakness. Even if they’re not consistently making the Top 8 or Top 16 or even the Top 64… they’re out there. You just have to run into one competently built and run by a competent player at some point before the Top Cut, and it could cost you. There were 732 Masters Division players vying for the top at the Regional Championship in Madison, WI this last Saturday (June 2nd), and while the only I can only confirm one [G] attacker in the Top 64, apparently there was an Alolan Exeggutor deck that showed great potential (but missed making Day 2). Of course, with 90 HP, I could have skipped most of that but guess what matters to the other Zygarde we’re looking at today? No Resistance IS the worst, except it is also the norm so it is just barely worth mentioning. Moving on, a Retreat Cost of [C] is very good but somewhat bittersweet; when a Pokémon is this small, even paying [C] to Retreat can get sticky. Earthen Aura is not a beneficial Ability, and I think that was deliberate. We saw a similar trick with Hawlucha (XY – Furious Fists 63/111), though the Ability was called “Shining Spirit”. Barring some radical change in how this game works, any time when ignoring the -20 damage from Resistance is worth ignoring the glorious x2 damage of Weakness is probably an academic exercise and not an actual game. In fact, Hawlucha has a similar trick with its attack, doing 60 for [F] BUT if you’re not attacking a Pokémon-EX, the attack does zero damage instead. In a sense, Zygarde is better because it always hits for at least 30 (barring protective effects), and when it does hit for 60, your opponent could have an Ultra Beast on his or her Bench. The catch? For starters, power creep: Hawlucha was doing 60 damage to smaller (on average) targets, and while it only had 70 HP but this was during the XY-era; 90 isn’t much more durable now. Hawlucha had [L] Weakness and [F] Resistance, which were useful back then and would be useful now because there aren’t a lot of great [L] Type attackers. Though the most important “bottom stat” is the free Retreat Cost; even when Hawlucha couldn’t attack it was a handy pivot Pokémon. Zygarde isn’t without its uses, but they are super niche. 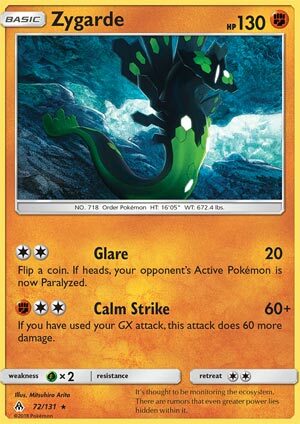 If Ultra Beasts truly take over the metagame, so that almost no deck goes without them, then a deck that can handle the [F] Energy cost might want to include a Zygarde if it also shuts down Abilities on its own Basic Pokémon. Ideally, it would do that while including [F] support, so that is a very tall order. Expanded finds things worse for Zygarde because it is a more diverse metagame; more alternatives to running Zygarde and more decks that would need to suddenly all run Ultra Beasts. In the Limited Format, Zygarde is a decently sized Basic Pokémon with a solid-ish attack. Unless you can’t afford the [F] Energy cost or are building a +39 deck around some other basic Pokémon, try to squeeze it in but remember it isn’t brilliant… just adequate with the occasional bright moment.